The intricate stitching of a lehenga choli dupatta set or a ghagra choli takes about a minimum of twenty days depending on factors like the fabric, embellishments. Hand-stitched, hand-woven Lehengas end up taking longer owing to the detailing that goes into it. Often, communities exclusively into designing lehengas have clear tasks allotted to them, which forms part of the whole making process. Lehenga Choli continues to undergo transitions with time, with cultural influences molding its silhouette or style in the multiple versions of the lehenga choli known to us today. Talking of traditional styles, there are a lot of variations to the lehenga – the Sharara, Gharara and Lacha. The Sharara, Lacha and Gharara are lower attires, emerging from the 18th and 19th century and resemble flared pants. 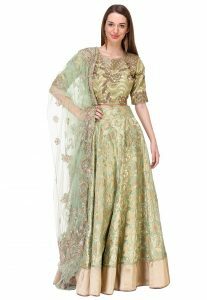 The common trait in all the three outfits is that they are three piece outfits comprising a blouse, long skirt, and a dupatta and are most popular as wedding outfits. The Sharara has a joint below or at the knee level, while the skirt below spreads out. The Sharara is worn with a Kurti and one or more dupattas. When two dupattas are worn, one is usually used as a veil and the other is draped on the shoulders. It is generally worn on weddings. Ghagras are another form of conventional skirt, but the difference lies in the gathers or pleats that the ghagra has around the waist and the lehenga is more form fitting and is cut in an ‘A’ line. Ghagra cholis come in many avatars; cotton chaniya cholis which are worn by women from Rajasthan and Gujarat, party wear ghagra cholis usually stitched in georgette, crepe, or silk. Wedding ghagra cholis are detailed with a lot of heavy embellishments like bead, Swarovski crystals, rhinestones, kundan, sequins and lot more in vibrant colors and patterns. Tie and dye ghagra cholis, bead & mirror work lehenga choli are also popular. The Gharara is only a Sharara divided into two and has a concentration of work at the knee also known as the goat. Lacha comprises a long blouse which almost comes to the length of knees. The skirt design may be same as the lehenga or ghagra. This is the type of ghagra with slight variation in the blouse. There are plenty of variations to the traditional lehenga – Lancha and Sharara. 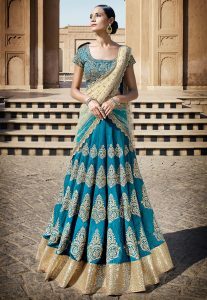 The Lehenga has also imbibed and merged with modern influences and global trends. The lehenga style Saree is one of the latest Indian ethnic innovations doing the rounds that merge the saree and lehenga silhouette into one. The lower half comprises a ready-made sari with pleats, fall and drapes resembling the flared portrait of lehenga, with a zip or knot at the waist side for adjustments. The upper half of the attire has to be tucked and wrapped around once which resembles the pallu of the saree. 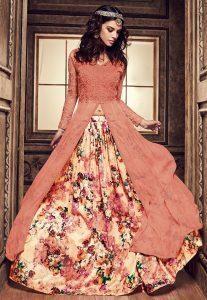 The Anarkali Lehenga is another recent innovation that the Lehenga has undergone. In terms of fitting or silhouettes, lehenga cholis are designed in A-line, Straight cut, Umbrella cut and Fish cut or Mermaid cut silhouettes. Then again, from being stitched with primary fabrics like cotton or silk in the earlier centuries, the lehenga is much experimented with in terms of fabric now. Fabrics that lehengas are stitched from now include satin, cotton blends, velvet, crepe, georgette and other material. From tailoring the lehenga choli in modern silhouettes to lending designer elements, urban motifs and styles, the Lehenga Choli is constantly being given a new avatar. Topnotch designers such as Manish Malhotra, Sabyasachi Mukherjee, Anita Dongre, Anju Modi and some others have also gone ahead to give a contemporary touch to Lehenga Choli. Lehengas are mainly worn to very special events such as weddings, parties and festivities. 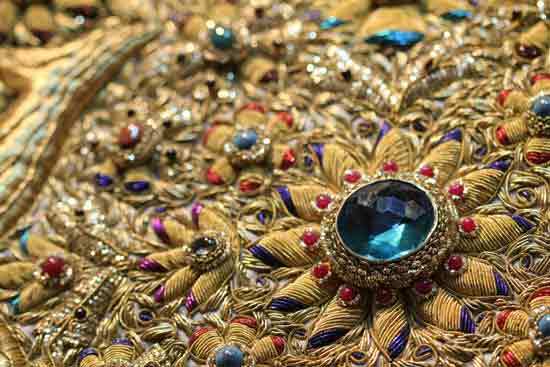 However, depending on the amount of detailing on the lehenga, one can team it with ethnic jewelry, like kundan, polka, meenakari, etc. For climatic suitability, Lehengas can be worn all year long, thanks to the options available in fabric. The lehengas in fabrics like brocade, velvet, satin and silk are best suited for winters. 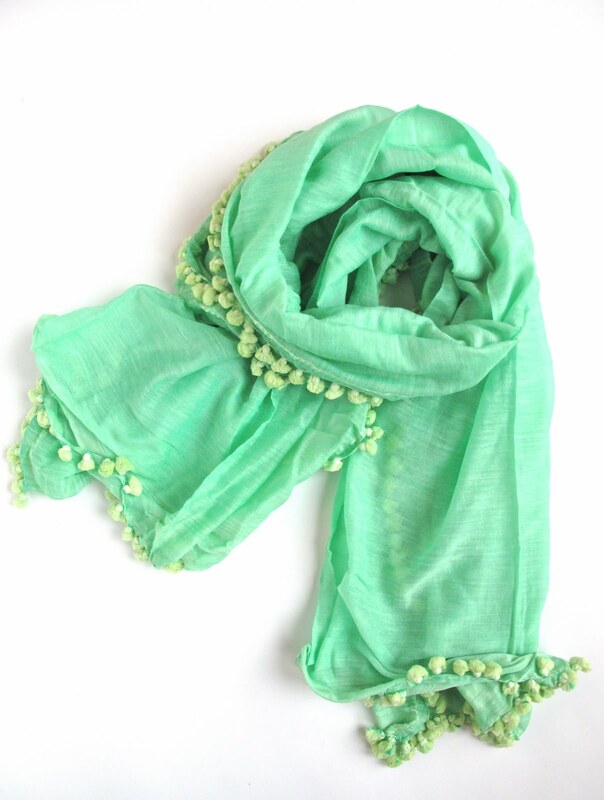 Lighter fabrics like silk, georgette and crepe can be worn in the summers. Lehengas and ghagra cholis need to be dry cleaned due to the multiple colors, fabrics used and the embellishments on them. These outfits should be stored in a dry place wrapped in plastic or a clean white cloth to prevent the metal decorations from tarnish. 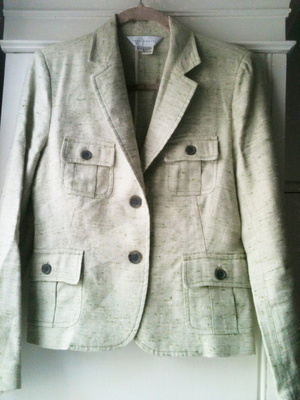 Dry-cleaning these outfits is the ideal way of maintaining them.